Riley Gardell is a 2015 graduate from Midway High School, and he is anything but ordinary. Riley showed great interest in serving the community during his time at MHS, through which he earned the Spirit of Midway Award four times. This year, Riley made huge strides by achieving what he has been working toward since his junior year in high school: a Congressional Award. This award was established by the United States Congress in 1979 to recognize outstanding initiative, service and achievement in young people. The Congressional Award has four separate categories that each require a specific amount of hours: volunteer service, expedition/exploration, personal development, and physical fitness. Within those categories, there are six levels of achievement: bronze, silver and gold certificates, and bronze, silver and gold medals. In order for a student to reach each level of achievement, he or she must write out a calculable goal for each of the four categories and work towards that goal. Riley already had the bronze and silver certificates, and had applied for the bronze medal. 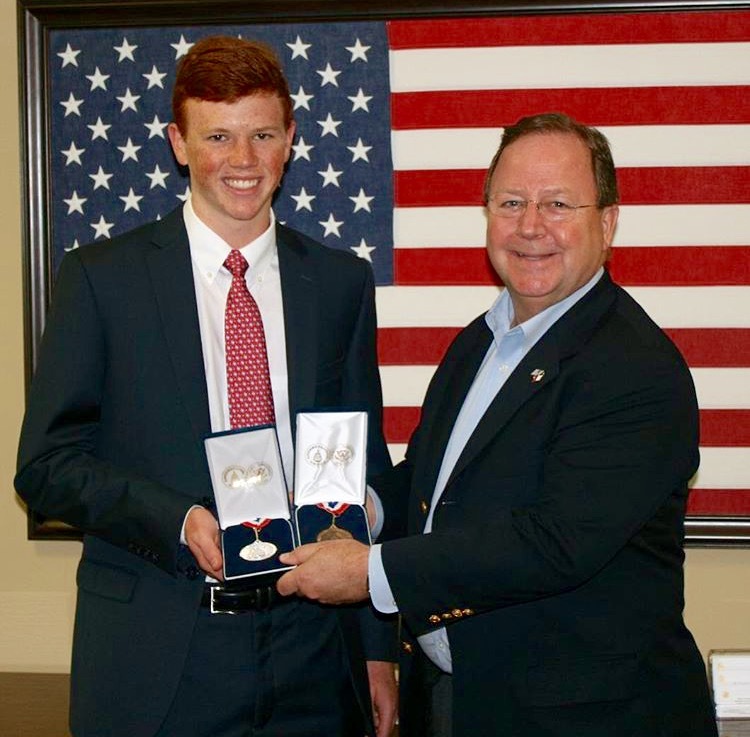 In July 2015, Riley was awarded with Bronze and Silver Congressional Awards by U.S. Representative Bill Flores. Riley has used his time for many activities, including volunteering at races, foster caring, and other various volunteer efforts. He played football in high school and has a passion for biking, which helped him to meet his physical fitness goals. Riley has also spent time at the Philmont Scout Ranch, and there he met all of the requirements through the gold medal level for the expedition and exploration category. Congratulations to one of our inspiring alumni, we are so proud to see the impact you are continuing to make after graduating!